Ten years ago, few people would have heard of a social network. Today, Facebook, Twitter and LinkedIn permeate our lives. They show us how we are linked to each other and how we are more broadly placed within society. What fascinates scientists is that the general properties of social networks seem to be invariant regardless of where they crop up. For example, one of the remarkable properties of social networks is their small world character. This means it is possible to go from one part of a network to any other part in a small number of steps (this is where the phrase 6 degrees of separation comes from). That was entirely unexpected and counterintuitive when it was discovered in the 1960s by the American social psychologist Stanley Milgram. But it is as true today of Facebook and Twitter as it was of the society in which Milgram carried out his experiments. Today, P J Miranda at the Federal Technological University of Paraná in Brazil and a couple of pals study the social network between characters in Homer’s ancient Greek poem, the Odyssey. 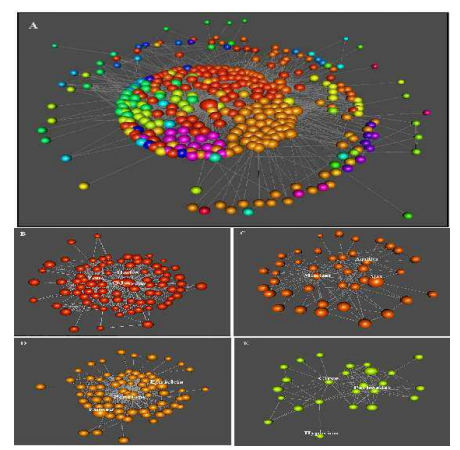 Their conclusion is that this social network bears remarkable similarities to Facebook, Twitter and the like and that this may offer an important clue about the origin of this ancient story. Miranda and co think of each character in the Odyssey as a node in the network. They say a link exists between two characters when they meet in the story, when they speak directly to each other, cite one another to a third character or when it is otherwise clear that they know each other. In analysing the Odyssey, they identified 342 unique characters and over 1700 relations between them. Having constructed the social network, Miranda and co then examined its structure. “Odyssey’s social network is small world, highly clustered, slightly hierarchical and resilient to random attacks,” they say. What’s interesting about this conclusion is that these same characteristics all crop up in social networks in the real world. Miranda and co say this is good evidence that the Odyssey is based, at least in part, on a real social network and so must be a mixture of myth and fact. This is not the first time that researchers have examined the social networks associated with ancient texts. Last year, researchers analysed three narratives in this way-Homer’s Iliad, the early English story Beowulf and the Irish epic poem Tain Bo Cuailnge. They discovered that while the networks associated with Beowulf and the Iliad had many of the properties of real social networks, the network associated with Tain was less realistic. That led them to conclude that the societies described in the Iliad and Beowulf are probably based on real ones, whereas the Tain appears more artificial. Miranda and co say the same is probably true for the Odyssey. Because its social network has many similarities to real social networks, it is probably based on the real world. Indeed there is much archaeological evidence to suggest that some of the events described in both the Iliad and the Odyssey actually took place. That’s a new and interesting test that gives an important insight into the history of these ancient texts. It also reminds us that no matter how different our society may appear to be from those that existed many centuries ago, they also have remarkable similarities. Indeed, if Milgram where able to repeat his small world experiments in ancient Greece, he’d probably get the same result. And Homer would undoubtedly feel right at home on Facebook.